This versatile stem-and-plate caster is suited for use on a wide variety of furniture including dressers, chairs, and cabinets. It features solid-brass construction, a one-inch diameter brass wheel, and our exclusive living antique patina. 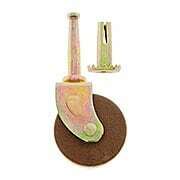 This round-cup caster is the perfect accessory for antique and reproduction tables, chairs, and sofas. 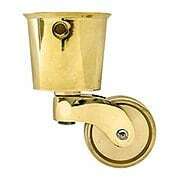 It features solid brass, a one-inch brass wheel, and comes in our exclusive living antique patina. 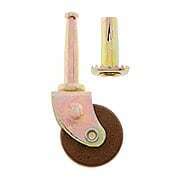 This round-cup caster is the perfect accessory for antique and reproduction tables, chairs, and sofas. 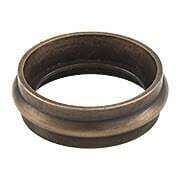 It features solid brass construction, a 1 ¼” wheel, and comes in our exclusive living antique patina. Enhance the beauty and sophistication of your Federal or Colonial-Revival style furniture with this stunning Small Clawfoot Toe Cap. Authentically reproduced in stamped brass, just like the antique originals, it easily fits over the foot of your table, dresser, or sofa. 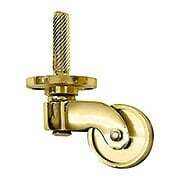 Available in antique or unlacquered-brass finish options, and comes complete with two brass nails for installation. 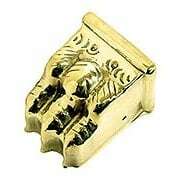 Protect the legs of your Federal or Colonial-Revival style furniture with these stunning Small Brass Clawfoot Toe Cap. Authentically reproduced in stamped brass, just like the antique originals, it easily fits over the foot of your table, dresser, or sofa. Our exclusive Antique by-Hand finish ages gracefully over time into a beautiful natural patina. Comes complete with two brass nails for installation. Enhance the beauty and sophistication of your Federal or Colonial-Revival style furniture with this stunning Medium Clawfoot Toe Cap. Authentically reproduced in stamped brass, just like the antique originals, it easily fits over the foot of your table, dresser, or sofa. 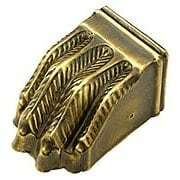 Available in antique or unlacquered-brass finish options, and comes complete with two brass nails for installation. 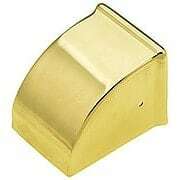 Protect the legs of your Federal or Colonial-Revival style furniture with these stunning Medium Brass Clawfoot Toe Cap. Authentically reproduced in stamped brass, just like the antique originals, it easily fits over the foot of your table, dresser, or sofa. Our exclusive Antique by-Hand finish ages gracefully over time into a beautiful natural patina. Comes complete with two brass nails for installation. Enhance the beauty and sophistication of your Federal or Colonial-Revival style furniture with this stunning Large Clawfoot Toe Cap. Authentically reproduced in stamped brass, just like the antique originals, it easily fits over the foot of your table, dresser, or sofa. 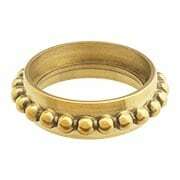 Available in antique or unlacquered-brass finish options, and comes complete with two brass nails for installation. 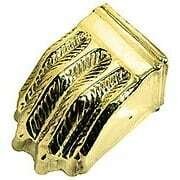 Protect the legs of your Federal or Colonial-Revival style furniture with these stunning Large Brass Clawfoot Toe Cap. Authentically reproduced in stamped brass, just like the antique originals, it easily fits over the foot of your table, dresser, or sofa. Our exclusive Antique by-Hand finish ages gracefully over time into a beautiful natural patina. Comes complete with two brass nails for installation. 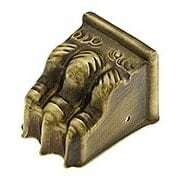 Enhance the beauty of your Federal or Colonial-Revival style furniture with this protective Medium Plain Toe Cap. Authentically reproduced in stamped brass, just like the antique originals, it easily fits over the foot of your table, dresser, or sofa. It features a lacquered coating to preserve the polished finish, and comes complete with two brass nails for installation. 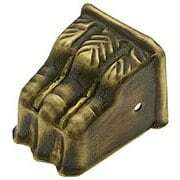 Enhance the beauty of your Federal or Colonial-Revival style furniture with this protective Large Plain Toe Cap. Authentically reproduced in stamped brass, just like the antique originals, it easily fits over the foot of your table, dresser, or sofa. It features a lacquered coating to preserve the polished finish, and comes complete with two brass nails for installation. Enhance the beauty of your Federal or Colonial-Revival style furniture with this protective leg skirt. Authentically reproduced in stamped brass, just like the antique originals, it easily fits over the foot of your table, dresser, or sofa. It features a lacquered coating to preserve the polished finish, and comes complete with one brass nail for installation. Enhance the beauty of your Federal or Colonial-Revival style furniture with this protective leg skirt. Authentically reproduced in stamped brass, just like the antique originals, it easily fits over the foot of your table, dresser, or sofa. Our exclusive Antique by-Hand finish ages gracefully over time into a beautiful natural patina. Comes complete with one brass nail for installation. 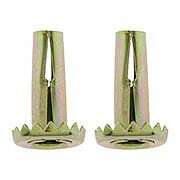 Pair of zinc plated steel sockets or sleeves for "grip neck" stem casters. Measures 1 1/4" tall with a 3/4" diameter base. The hole diameter at the bottom is 5/16". This versatile stem-and-plate caster is suited for use on a wide variety of furniture including dressers, chairs, and cabinets. 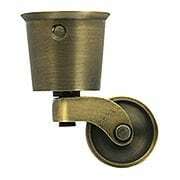 It features solid-brass construction, a one-inch diameter brass wheel, and comes in your choice of different popular finishes. This round-cup caster is the perfect accessory for larger antique and reproduction tables, chairs, and sofas. 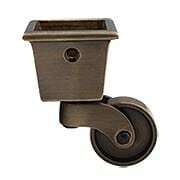 It features solid brass, a one-inch brass wheel, and comes in your choice of three popular finishes. 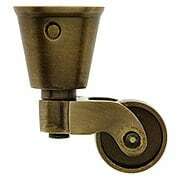 This large Square-Cup Caster is suited for use on antique and reproduction tables, chairs, and sofas. 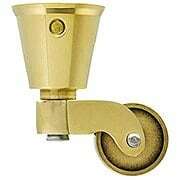 It’s made with heavy-duty solid brass for durability, features a 1 ¼” wheel, and comes in three popular finishes. 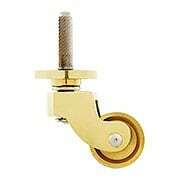 This large grip-neck caster works well on a wide variety of furniture including tables, cabinets, and chairs. It features solid-steel construction, steel housing, and a 1 1/4” dark hardwood wheel. 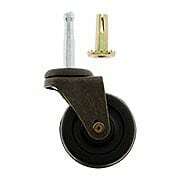 This large grip-neck caster works well on a wide variety of furniture including tables, cabinets, and chairs. It features solid-steel construction, steel housing, and a 1 5/8” dark hardwood wheel. This large, grip-neck caster is perfect for supporting heavier items like a kitchen island, butcher block, or work table. It’s constructed of solid steel with a ball bearing for added strength, and a two-inch rubber wheel. It comes in an antique-brass finish. This heavy duty, English-style furniture caster is a great choice for sofas, dining tables, or other large pieces. 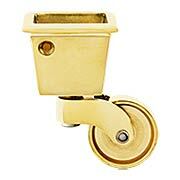 It features solid-brass construction, a one-inch wheel, and comes in your choice of three popular finishes. 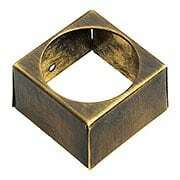 Give your stem-and-plate caster a polished look with this decorative caster ring. 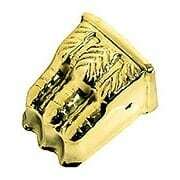 Made of solid brass for durability, it comes in your choice of two classic finishes. With a 15/16" inside diameter, it's designed to fit a 7/8" caster plate. 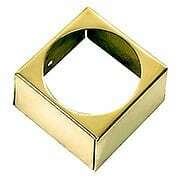 Give your stem-and-plate caster added flair with this decorative caster ring. 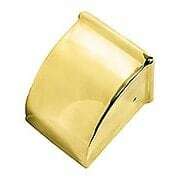 Made of solid brass for durability, it comes in your choice of two classic finishes. With a 1 3/16" inside diameter, it's designed to fit a 1 1/8" caster plate. This heavy duty, English-style furniture caster is a great choice for sofas, dining tables, or other large pieces. Made of solid brass, it features a one-inch wheel and comes in our exclusive Antique-By-Hand, a living finish that ages gracefully over time into a beautiful natural patina. 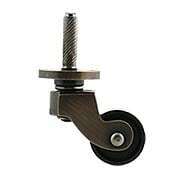 This large square-cup caster is suited for use on vintage and reproduction tables, chairs, and sofas. Made of heavy-duty solid brass, it features a 1 1/4" wheel, and comes in our exclusive Antique-By-Hand, a living finish that ages gracefully over time into a beautiful natural patina. 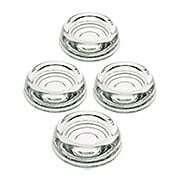 These sturdy caster cups are an attractive and understated way to protect your carpet from damage by furniture feet. 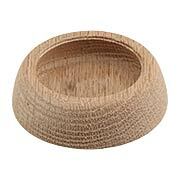 Made of solid oak, with a shallow cup, they are strong enough for large and heavy furniture pieces. 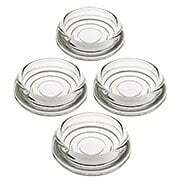 Features a 2 1/2" base diameter and 1 5/8" opening diameter. 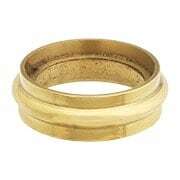 Give your stem-and-plate caster a polished look with this solid-brass, decorative, caster ring. Presented in our exclusive Antique-by-Hand finish, it ages gracefully over time into a beautiful natural patina. With a 15/16" inside diameter, it is designed to fit a 7/8" caster plate.